Common English name:Common violet, sweet violet, heartsease, pansy, wild violet, love-in-idleness. – Spanish / español: pensamiento, trinitaria, pincel, suegras y nueras. Scientific name: Viola tricolor L.
Etymology: The scientific name of the genus “Viola” comes from Latin, which in turn, comes from the Greek word “Io“. In mythology, “Io” was Jupiter’s lover. Jupiter’s wife was jealous of Io, so Jupiter protected her by turning her into a calf that fed on the meadow. So that “Io” could feed well, Jupiter created the violets. The name of the species “odorata” (= odor) comes from the Latin and refers to the very characteristic intense aroma that this violet produces. Origin: Coming from Europe, it lives mainly under the trees of the forests of this continent and in North Africa, the Canaries and the Caucasus. It needs a certain humidity to be able to live adequately, so it prefers shady areas both under the trees and next to sunny walls. orchards, edges of the roads or between the lawn grass, preferably on calcareous soils. It has been introduced as an ornamental plant in North America and Australia. Habitat: uncultivated land, fields, etc.. In gardening hybrid varieties are grown for ornamental purposes. Annual or biennial plant with a woody stem till 15 cm high.Barely visible stems from a fleshy root, with stoloniferous buds. Leaves in rosette, largelly pedunculated, heart-shaped. Peduncles of the leaves with long hairs bent towards the ground. Dark violet (sometimes white) flowers up to 2 cm in length, located at the end of long peduncles that sprout from the armpits of the leaves. They have 5 petals, two of which stand out for growing vertically. It also differs from the rest of the violets by having a style in the form of a hook. It blooms from mid-winter to early spring (late February to April) being the month of March when it can be found in greater abundance, hence that French, Dutch or German is also known as March flower. Both the legendary origin of the violet, and its peculiar smell, has been transcendental in turning it into a symbol of love. There have been many lovers who have shown their love by giving their beloved some violets. The aroma of violet has also been used to create filters of love, with which the beloved woman could be conquered. Essential oils (0.04%) (mainly in the roots): Methyl salicylate, salicylic acid esters, nanadienal, nonadienol, octodienol, benzyl alcohol, eugenol, parmona. As a medicinal plant, flowers are used mainly in infusions or syrups. You can also use the leaves. 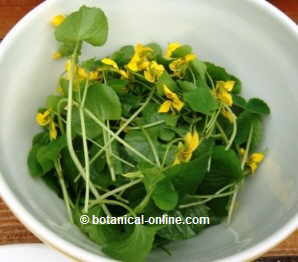 The leaves of this are edible and are used both in natural medicine and in food. 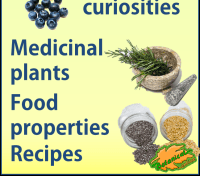 Traditionally the plant has been widely used since ancient times. The Greeks used it internally as a cardiotonic, to eliminate discomfort or for body purifying in cases of gout. 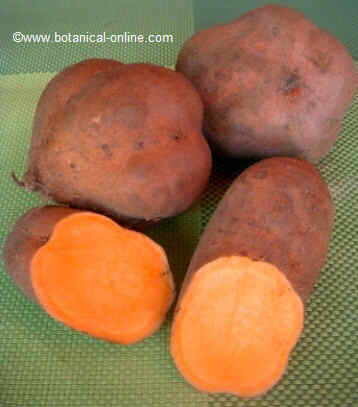 Externally, it has been use for the belly pain or wound healing. “Both the tame and the wild are so well known, that they need no description. Time.] They flower until the end of July, but are best in March and the beginning of April. Government and virtues.] They are a fine pleasing plant of Venus,, of a mild nature, no way harmful. All the Violets are cold and moist while they are fresh and green, and are used to cool any heat, or distemperature of the body, either inwardly or outwardly, as inflammations in the eyes, in the matrix or fundament, in imposthumes also, and hot swellings, to drink the decoction of the leaves and flowers made with water in wine, or to apply them poultice-wise to the grieved places: it likewise eases pains in the head, caused through want of sleep; or any other pains arising of heat, being applied in the same manner, or with oil of roses. A dram weight of the dried leaves or flower of Violets, but the leaves more strongly, doth purge the body of choleric humours, and assuages the heal, being taken in a draught of wine, or any other drink; the powder of the purple leaves of the flowers, only picked and dried and drank in water, is said to help the quinsy, and the falling-sickness in children, especially in the beginning of the disease. The flowers of the white Violets ripen and dissolve swellings. 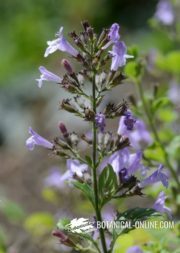 The herb or flowers, while they are fresh, or the flowers when they are dry, are effectual in the pleurisy, and all diseases of the lungs, to lenify the sharpeness in hot rheums, and the hoarseness of the throat, the heat also and sharpness of urine, and all the pains of the back or reins, and bladder. It is good also for the liver and jaundice, and all hot agues, to cool the heat, and quench the thirst; but the syrup of Violets is of most use, and of better effect, being taken in some convenient liquor: and if a little of the juice or syrup of lemons be put to it, or a few drops of the oil of vitriol, it is made thereby the more powerful to cool the heat, and quench the thirst, and gives to the drink a claret wine colour, and a fine tart relish, pleasing to the taste. Violet (Viola odorata L.) is a medicinal plant of the same family as pansy. It has emollient and antitussive properties (mainly contributed by its mucilages), sudorific and anti-inflammatory (because of salicylic acid). The plant is mainly used for its flowers, which are a traditional remedy for respiratory diseases, both in infusion and in syrup. 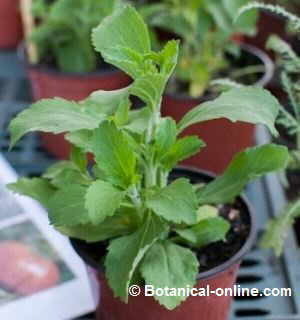 The root is also used, with emetic properties, and the leaves, as an edible plant. Violet flowers are also used in phytotherapy, along with other medicinal plants, to give aroma and color to many preparations. Common violet, mainly by its content in mucilage, has soothing, antitussive and anti-inflammatory properties. 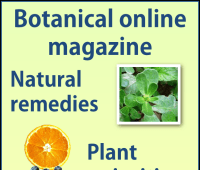 Moreover, its content in saponins confer expectorant properties, whereas salicylic acid gives analgesic properties. Cough: The bechic properties of violet make it well suited to combat coughs, either dry or productive cough. (Infusion of a half teaspoon of dried flowers per cup of water. A couple of cups a day). 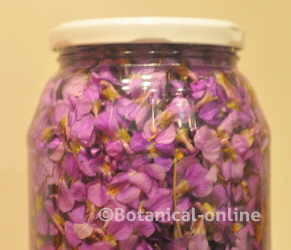 Even more interesting is a homemade cough syrup made with violet flowers and sugar. Influenza: The previous treatment can help make the flu more bearable, especially when the patient presents with thirst attacks or when fever is very high. Constipation: Malic acid exerts a mild laxative function, effective for the treatment of constipation. (Infusion of a spoonful of dried flowers per cup of water. Drink two cups a day)Increasing the dose, a slightly laxative effect is obtained when needed for a more drastic treatment of constipation. Violet can be used for combat vomiting (antivomitive) or to to induce vomit (vomitive= emetic). In the first case, we take advantage of the demulcent properties of the mucilage. 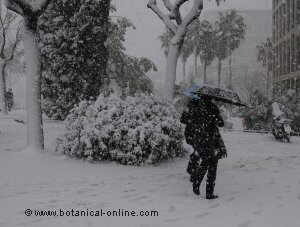 Saponins, on the contrary, are responsible to cause vomiting when the plant preparations are taken in higher quantities. Cleansing and diuretic properties of violet have been used to increase urination and facilitate the cure of diseases where it is desirable a higher urine production and the elimination of toxins. In addition, mucilages exert very useful anti-inflammatory properties as an adjunct to the treatment of various kidney diseases. Sore throat and tonsilitis: Gargles with the same preparation help reduce swollen tonsils and sore throat. Violet contains numerous analgesic and anti-inflammatory principles (salicylic acid, methyl salicylate, eugenol, beta-sitosterol, quercetin, rutin, etc.) Its properties to fight pain and reduce inflammation can be very effective in the treatment of arthritis, arthrosis or carpal tunnel syndrome. Equally interesting is the violet ointment made with lard and violet leaves. 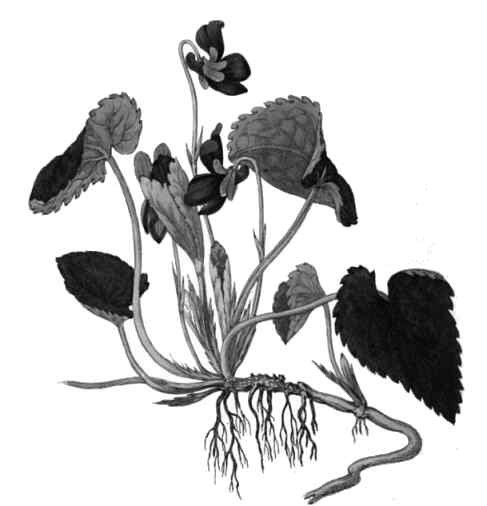 Some authors consider the leaves of these violets as edible plants, especially when they are young and tender during the winter. They can be added to raw salads or used to flavor soups. 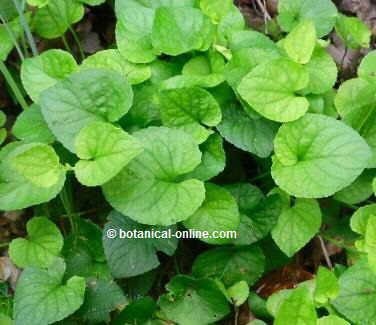 Violet leaves are used to make soups, add in salads or in different recipes with wild plants. Young leaves have a pleasant flavor, the old ones are more bitter and are not used in salads, although they are added to soups and creams. Due to its high mucilage content, thick soups and vegetable creams are made with them, very suitable for coughs, colds or constipation (fibers soften the irritated throat and digestive mucous membranes). Leaves and flowers of a type of violet (Viola tricolor) prepared to be cooked. They are used for medicinal purposes and in the kitchen as an edible flower. 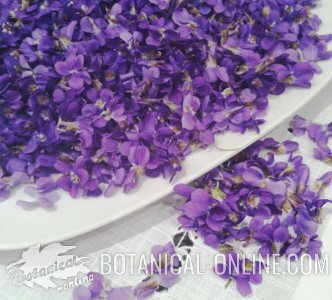 The flowers of the violets are used as edible flowers. They can be added fresh to the salads to give flavor and provide an exotic touch to them. In some places they are prepared candied with sugar. 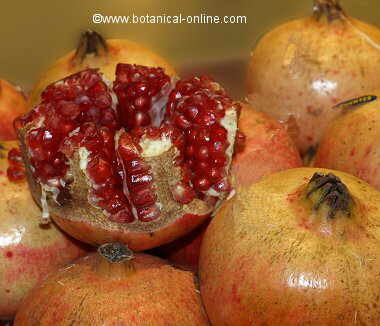 In addition, these flowers are very rich in quercetin and rutin, two flavonoids with many properties. 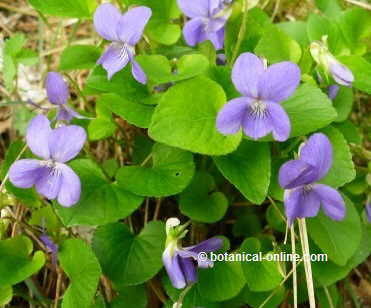 Perfumery: The flowers and leaves of common violet are used to extract essential oil that is used in perfumery. Food industry: From the leaves of the violet flavors are extracted that the food industry uses to flavor its products, especially in the manufacture of ice cream, confectionery or confectionery products. Used in proper doses no toxicity or contraindications are observed. When taken in higher doses, it presents an emetic effect, due to its content in saponins, especially in the root. Flowers are harvested in early spring and roots in early autumn. All of them should be dried in the shade and stored in a dry and dark place inside bags or glass jars.